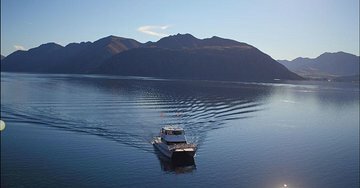 Sail around the serene Lake Wanaka on this late-afternoon ‘happy hour’ cruise. With a complimentary beer or wine in hand, cruise around the southern end of Lake Wanaka, the majestic Southern Alps in the distance. Sail around Waterfall Creek, Ruby Island and Stevensons Peninsula, and even see the famous ‘Lone Tree’ – a famous willow growing out of the lake.